Mr. Shahid Fiaz the Chief Executive Officer (CEO) of TDEA holds two Master of Arts (M.A) degrees in Mass Communication and Political Science from University of Punjab, Lahore. Mr. Fiaz is playing a pivotal role at TDEA in setting up the tone of Secretariat’s (TDEA) project offices by demonstrating consistent values of high ethical standards, integrity and fairness. He ensures the Trust and its projects meet its short term operational and long term strategic goals and objectives within the specified time frame. Mr. Fiaz has brought an enriched professional experience to TDEA, however before joining TDEA he was working with Asia Foundation as Director of Programs and was managing a large and diverse portfolio with a value of approximately US$20 million/ year. 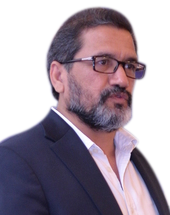 During the course of his professional experience he is the one who contributed his best efforts in setting up South Asia Forum for Human Rights in Pakistan and India and provided support and leadership to a team of 23 professionals in the area of human rights, media, democracy, peace building, and rights of ethnic and religious minorities. He established country offices of South Asia Forum for Human Rights in Pakistan and India, developed human resource policies, in line with country registration laws, hired staff and put in place systems for administration, finance and developed strategies for overall operational environment. Mr. Fiaz has also worked in the capacity of a journalist from 1991 to 1995. He has worked with various newspapers as reporter, sub-editor and News Editor with The Frontier Post, The Musawat (Urdu), Associated Press of Pakistan (APP), The Imroze (Urdu) and Indus News Channel. As an intern, he had worked with Pakistan Times, Human Rights Commission of Pakistan and Pakistan Institute of Labor Education and Research.